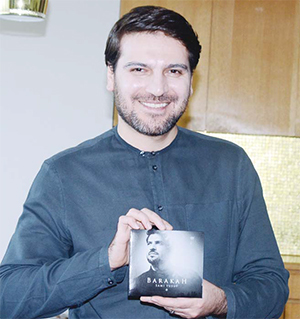 KUWAIT CITY, Dec 4: Sami Yusuf hopes to unveil hidden gems of the past thousand years of tradition with his new album, Barakah, he told the Arab Times, ahead of his performance at the Jaber Al Ahmad Cultural Centre on Sunday evening. With eight studio albums that have sold 34 million copies to date, he is one of Britain’s most exciting cultural exports of the past decade. Millions are familiar with his strikingly strong, clear voice, heard over radio, on TV, and in sold-out concert halls, stadiums, and city squares. His music has conveyed a profound sense of the sacred and in entrenched in the belief that all the world’s traditions are expressions of the same essential spiritual truth. Music, to him, has been a means to express divine love. Yusuf shared his excitement to be performing at the new Jaber Al Ahmad Cultural Center and expressed his gratitude to the British Council in Kuwait for bringing him here. He was steered towards music, specifi- cally the business and production aspect of it, at an early age since his father was a composer. At 19, after a spot of disillusionment, he had plans to pursue a simple life with a law degree in hand. But with 9/11, he, like many others in his community, was faced with a crisis of identity. In this onslaught, when Muslims felt attacked just by association, Yusuf released his first album, Al Mu’allim for the British Muslim community. Despite his modest intentions, the album resonated with wider audiences, it was an instant hit in and around the Muslim world spending 12 weeks at the top of the charts in both Egypt and Turkey. This became Yusuf’s point of discovery of his calling and he has continued in pursuit, for fifteen years now. After the astounding success of his first two albums and his rise to the status of an icon, Yusuf found himself contending with the onus of celebrity thrust on him and decided to take a five year break. “I had already become Islam’s biggest rockstar and there was nothing more to achieve other than a Nobel peace prize. I began to question why I was making music — for more accolades, to be more famous, or to be more loved? I was not inspired musically”, he told the Arab Times. Al Mu’allim had been pivotal in creating a market for sacred music of its kind and Yusuf was pressured to release more albums. “I travelled inward, studied and read. I came back with my third album ‘Wherever You Are’ in 2010 and my biggest hits till date come from that album.” Subsequently, he released The Center, an overtly Sufiand philosophical album and ‘Songs of The way’. Yusuf leans towards traditional music and instrumentation employing traditional instruments that were formed in the Islamic civilization. Sami’s music takes much of its structure from traditional musical systems and within this framework, combines power and beauty in its dynamic rhythms and interwoven melodies. Yusuf confesses to not be perturbed of the sway of modern music over the traditional. “I am not worried about the continued existence of traditional music because people yearn for it. In the west, here is a huge market for the alternative, organic or niche. People are tired of the mainstream.” He did share his sadness over instances where the East has moved away from its rich, traditional culture as a result of considering themselves backward and seeing the way forward only through assimilating with the culture of the West. The United Nations appointed him Global Ambassador Against Hunger, and in his role as an Ambassador for the UN World Interfaith Harmony Week, Yusuf reached out to people of all major faiths with his composition of the world’s first interfaith anthem, ‘The Gift of Love’. Speaking of his efforts in this regard, he said, “We have to acknowledge that while a lot of work has been done to promote interfaith dialogue, it has become more sentimental. Exclusivism is extremely dangerous. We need to go back to the intellectual route and acknowledge that we share a truth. He drew attention to the fact that social media has been disastrous in many ways, “It hasn’t increased visibility, you are a fish in the ocean. Secondly, you just create echo chambers, a bubble, an alternate reality that is not the truth. Play, sing, practice. Don’t worry about how much audience you have or how may come and see you.” He shared that it is important to cultivate a meaningful relationship with fans and followers to ensure longevity in the industry.